Supertramadol.com is an online pharmacy. It seems like a promising brand that offers quality products at great prices. The site looks secured and well designed, and this is a positive sign. We tried to scavenge every bit of information we could for our review. Sadly, there is little to no information available in the About Us section. The contact details are not transparent. It appears as the company tries its best to avoid any contact with its clients. This got our attention, and we will review this platform to see if it’s trustworthy or not. ScamAdviser gives Supertramadol.com a positive start. It provides the pharmacy with a high trust rating of 87%. The website is believed to originate from the Dominican Republic while the servers are from the United Kingdom. The site is believed to be a subsidiary Privacy by Default. This website majorly deals in medicine related to infertility issues. Canadian International Pharmacy Association is among the most trusted review platform. Unfortunately, it only verified 60 sites so far. Supertramadol.com failed to make it to the list and is labeled as Invalid by CIPA. This is not uncommon. LegitScript labels Supertramadol.com as Rogue. Yes, LegitScript is known for its bold and transparency, and it hardly trusts anyone. We barely came across a favorable review by the legit script so far. But, it does give a heads-up of what we should expect from the company. LegitScript describes a rogue pharmacy as someone that engages in bad business practices. It doesn’t meet the safety standards of the medical industry and does its best to make milk their customers. PharmacyChecker is among the more important review platforms on the internet. We had high hopes Supertramadol.com made into the verified list, but we had a surprise waiting for us. The pharmacy failed to make into any of Pharmacy Checker’s list, be it verified or scam. We can’t say this is a deal breaker because Supertramadol isn’t in Pharmacy Checker’s database at all. It is a disappointment rather than a red flag. TrustPilot as no data available for us. Yes, as you can see the platform has no customer review, and therefore it doesn’t have a word to say about Supertramadol.com. This is very unlikely. TrustPilot is a popular platform that offers accurate insights. While it doesn’t give us a perspective, it shows that Supertramadol.com is not as famous as it claims to be because let’s are honest, this is not the first platform that doesn’t have anything on this online pharmacy. We had the same results as many others. WOT has no data available for us. This is rare. Supertramadol.com isn’t a well-known brand as far we can tell. But this is a new low. The Safety Rating is unknown, and Reputation is n/a. There is no data available or Trustworthiness and Child Safety. Moreover, there are no customer reviews. Given the long history of this company, this is a bummer. The company needs to take dire actions to improve its current situation. This is unacceptable. As expected, there are no Google Reviews. 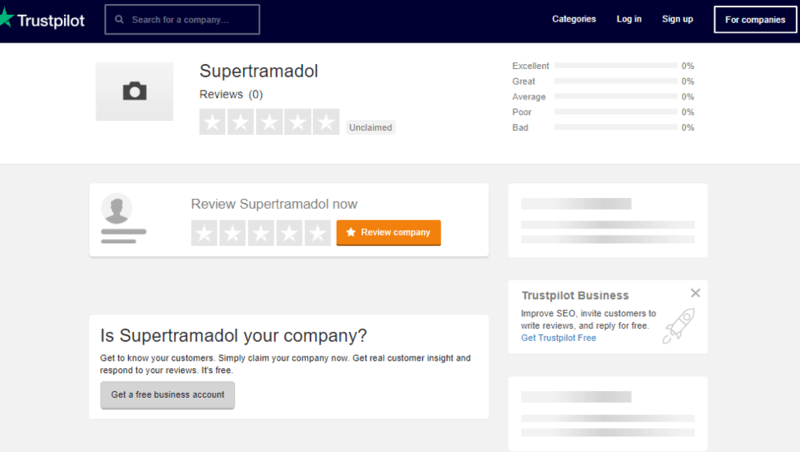 Supertramadol.com has no Google customer reviews. This is a major mistake because Google reviews are a free advertisement. If the brand had any positive reviews, it would help create a positive brand image for Supertramadol. But, that’s unlikely to happen because the pharmacy doesn’t even have a profile. Supertramadol.com doesn’t care about its customers, and hence it doesn’t offer any customer loyalty programs. The company lacks a strong advertisement and has poor customer support. It has low trust scores. The website doesn’t offer anything beneficial to the client. It only looks forward to ripping money off from you. There is nothing positive about this Pharmacy. We tried our best, but there was not one silver-lining. We couldn’t find anything that would give a positive impression and hence, we suggest you avoid this online pharmacy. The company is guilty of fraudulent business practices. It offers counterfeit products for high prices. It clearly shows that Supertramadol.com is not a client-oriented brand. We rate Supertramadol.com on 1 star out of 5 rating.